When an existing roof system fails to perform, it can be costly. That's why you need a roof system that has a proven track record, and a quality-assured roofing contractor that knows proper installation techniques in the DeLand, Deltona, Orange City, DeBary, Sanford, Altamonte Springs, and surrounding areas in Volusia and Seminole Counties. At RDG Roofing our experienced craftsmen are fully trained in the installation and repair of a diverse range of roof systems suitable for residential buildings. Weather change can create harsh realities that – if unchecked – may cause further material erosion and destruction. Do not take the chance or waste your money on second-rate material or unproven roof systems. Complete roof replacement is often not necessary, and we are able to save existing roof systems through planned repairs and the process of a cycled maintenance schedule. Our restorative programs will give you additional years of life from your roof systems, when other companies would only sell you a new roof. RDG Roofing also specializes in recovering existing flat roofs and low-slope roofs with products supported by the best warranties in the industry. Although RDG roofing materials are revolutionary, the actual application process is fast and simple. We will be happy to provide a free estimate, just give us a call. A roof is a major financial investment! 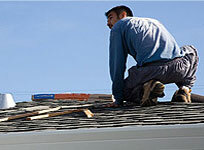 Trust your roof with the expert roofing contractors at RDG Roofing. Call us for an estimate. RDG Roofing proudly serves: DeLand, Deltona, Orange City, DeBary, Daytona Beach, Ormond Beach, New Smyrna Beach and surrounding cities.